Asparagus with Prosciutto and Chevre, Thyme for Cooking easy starters. 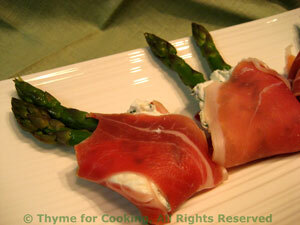 Quickly blanched, the asparagus spears are then wrapped in Prosciutto with a dollop of goat cheese at the base. Snap off bottom ends of asparagus. If using white asparagus peel half way to tip. Cut off 4 inch (10cm) tips and refrigerate rest of the stalks for another use. Bring a medium pan of water to boil and blanch the asparagus tips for 2 minutes if slender, 3 minutes if thick. Snip/chop basil leaves (hint: I hold the leaves together and snip with a scissors). Put chevre in small bowl, add 1 tsp water and the basil leaves. Stir to mix. Cut the ham in half the short way - you should have a slice that is about 2" X 3" (5cm X 7.5cm) - not important but you get the idea. Put a heaping teaspoonful of chevre mix on ham slice, add 2 asparagus spears so that half is sticking above the ham, and roll ham around bottom of asparagus and chevre so you have a little bundle with the asparagus tops sticking out the top. Repeat with remaining ingredients. Put 3 bundles on a plate, garnish with olives and serve. Can be made a couple of hours ahead and refrigerated.